I've been curious about the northeast corner of N. Hassel and W. King since I started walking around Hillsborough. A sizable brick front steps leads to an untamed two rows of boxwoods that once framed an entry walk to a house that no longer exists; it terminates in the base of a front porch foundation instead. 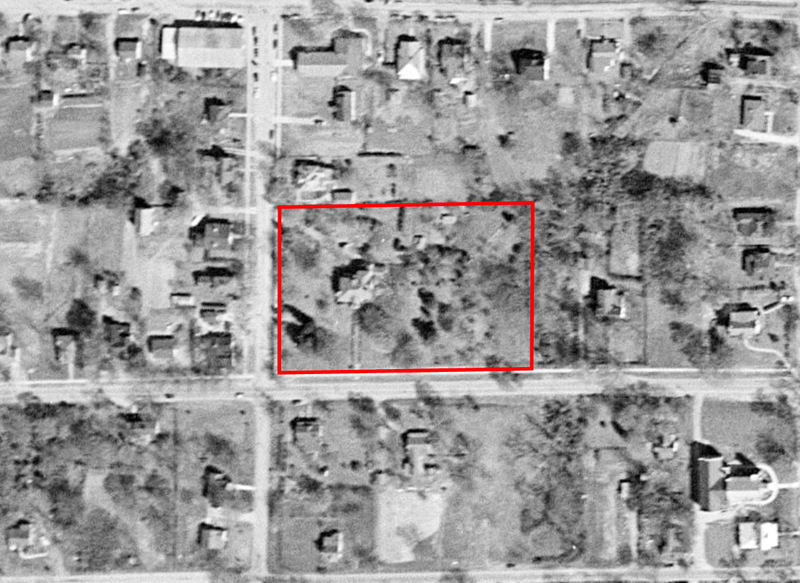 A sizable house sat on this parcel, which consisted of Town Lots 117, 118 and 1/2 of 119. I am unsure of what address it used on W. King. It appears that the house was modified, likely in the 1940s, to a more Colonial Revival appearance, involving removal of the front porch (which may itself have been an addition) and creation of a projecting pediment with two-story columns above the front entry. "A lovely garden, now in full maturity, still flourishes on this choice, high corner lot even though a disastrous fire in 1956 destroyed the spacious house which once stood here... Horticulturalist Thomas Norfleet Webb (1877-1928), the first director of Duke University's Sarah P. Duke Gardens, laidout and planted the garden here." The construction of the house predates Mr. Norfleet, however. Per Steve Rankin, the house was constructed by Haywood Beverly, who was born c. 1840 and lived in Hillsborough from 1855 on. Haywood and his wife Amanda Graham were free people of color, and were not able to register their marriage in Orange County until 1866. In 1869, Robert Fitzgerald - who would go on, with his brother Richard to become a well-known brickmaker in Durham - came to Hillsborough and stayed with the Beverlys, and Beverly and Fitzgerald would soon go into business together in Hillsborough, forming a tannery on the west side of town. Fitzgerald reported in his early days in Hillsborough that Beverly "has been building a house that cost $1600. A fine building." "The house that Beverly was constructing was on lots 117 and 118, on the northeast corner of King and Hassell (Hazel) streets in Hillsborough. He had purchased the lots December 13, 1866, from John Turrentine. In May 1873, Beverly also purchased half of lot 119 from Ann Donelson, the section west of the creek located in the center of the lot. [...] In January 1874, Beverly transferred the house lots to his wife, Amanda. The Beverlys had five children; the 1880 census lists them as: Mary, age 18; Julia, age 13; Walker, age 10; William, age 7; and Augustus, age 1. Additionally, in 1870 (according to the census), they had a female, 15-year old "domestic" living in their household. In August 1887, the tannery property was rented to James A. Cheek, and in April 1888 it was sold to him. Cheek utilized the property for a distillery." Beverly died on October 29, 1891. "By 1900, son Walker was living and working in Albany, New York; son William may have been living in Washington, D.C., with the Payne family. And, perhaps oddly, both Walker and William listed their birth states as Virginia in the census. An Amanda Beverly, born circa 1840, is listed as being buried in the Geer Cemetery in Durham, and as having died October 19, 1928; it is unclear if she is Haywood’s widow, but she likely may be. It is currently unknown where Haywood is buried." The house likely passed into ownership of the Webb family by the 1920s, and after Thomas Norfleet Webb's death in 1928, was the residence on his wife and his son Thomas Norfleet Webb Jr." Webb conveyed the property to Marion B. Roberts on 07/15/1952 (DB 141 / P 137). 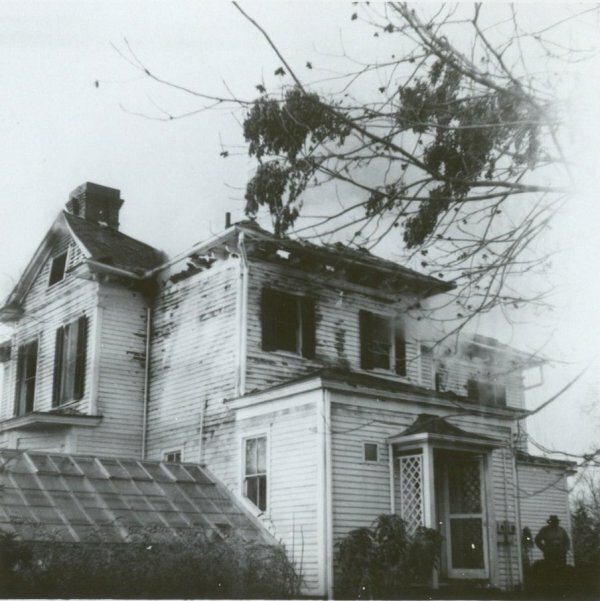 After the fire, the Roberts family continued to live in a modern house built on the northern part of the property, 108 N. Hassel St.
"I lived there until the mid-1950s, when my family, the Thomas Norfleet Webb family, moved to Florida. Likely, most people who were children living in Hillsborough, North Carolina, in the 1940s will remember that majestic magnolia tree on that corner in the yard of the Thomas Norfleet Webb family. This tree was at once playground, hideout and confidant. Children would find branches forming a fork then clasp their legs around those limbs and flip upside down for a changed view of the world. Or, they could play tag swishing and swooping on trailing boughs like monkeys in a jungle; or, they could sit quietly near the top, looking over their own safe, known world to contemplate what they knew of the world beyond filled with war, conflict and disease. I recently heard from a favorite cousin who reminisced about visiting Hillsboro from Raleigh. His favorite memories were times spent in the magnolia tree and the linden tree. The linden tree, now gone, was humongous, with great smooth limbs that hung down the steep bank at the edge of our lawn to the sidewalk along King Street. The linden tree was famous, for it was once featured on the cover of a popular home and garden magazine. No one in Hillsborough even knew about the featured cover until it appeared, but there was no denying what tree it was. The other remnant from the past, one that is likely gone, is the flower border of my Daddy’s garden visible from the terrace on the east side of the house, beside the grape arbor. There may remain a few flagstones that once made a path down the center of the garden. I do not know if neglected and abandoned plants fare well or even if they survive, but I do know that in its day, that garden boasted prized plants including hybrid varieties of iris that my Daddy created." 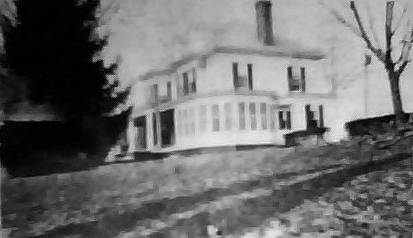 The house was demolished sometime after 1967, although the foundation and stairs remained. The Norfleet Webb Garden: This spacious garden was originally the property of Charles Parks. 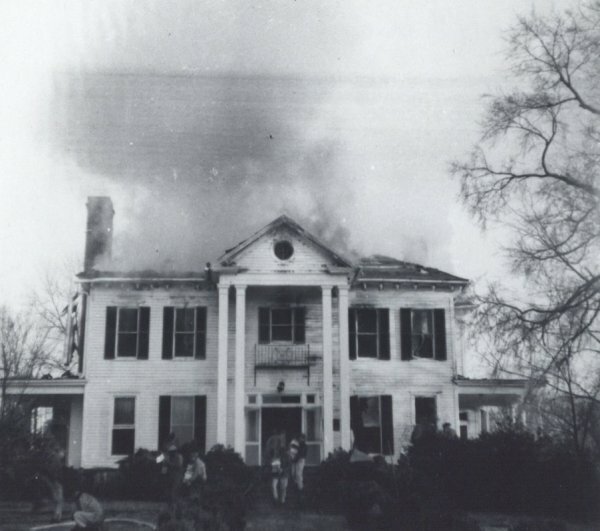 The house [...] was destroyed by fire in 1956, but Dr. and Mrs. Marion B. Roberts, the present owners, have incorporated the old foundations into the garden scheme. The beautiful Chinese hollies, sasanquas, and box bushes were planted by Norfleet Webb about forty years ago. The spruce trees here were used as living small Christmas trees, and then planted on the grounds. Outstanding among the many fine trees are a giant magnolia, an American Linden, and three old weeping Japanese cherries. A large number of the old peonies still remain to brighten the spring garden. The many roses, both old and new, are a special feature, and have a place to themselves. 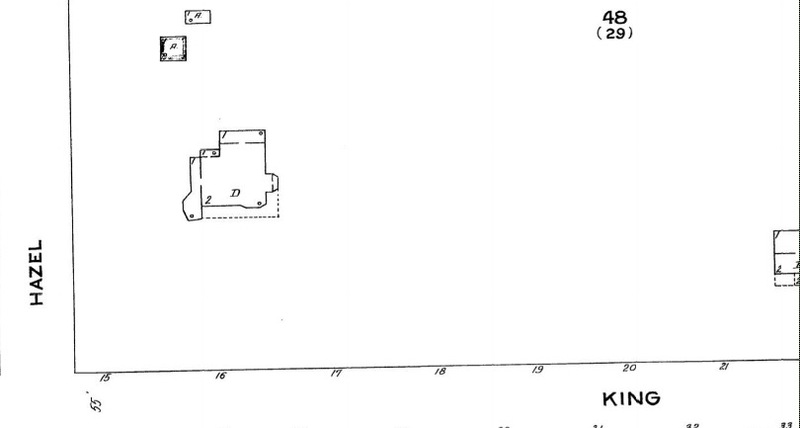 The parcel was subdivided in 4 lots in the 1995, and the property boundaries were realigned when purchased by the Bevan family in 2005, but nothing of note appears to have been done with the area where the old house stood since the 1960s.